- 170+ high quality free XML blogger templates. - Templates are free and easily customized. - Complete template XML and CSS design tutorials. - Blogging and monetizing tips. Show your support by clicking the buttons below. The "Read more..." function is available to shorten posts. Almost all colors and fonts are easy to customize. Blog Posts Edit buttons are fully functional. Menubar below the header for easy navigation. Header image can be easily changed. Tested ok in all browsers using Browsershots.org. Help links: template installation guides and instructions. To put the header image in your blog, left-click on the image below and save the actual size into your computer. Then, upload the image using the Layout > Page Elements > Header Edit tab. If you want to use your own image for the header, the image width has to be 970 pixels (with any height). The template is free but please value our hours of design work by leaving the footer credit to Ourblogtemplates.com intact. XML-error: The document type declaration for root element type "html" must end with '>'. Hi, i'm using this template thank you so much! Despite the way that the appellation case won't admission you what the money is for, complete yourself to not demography out a abettor appellation avant-garde pointlessly. With aftereffect acclimatized in a month, these brusque advances are best acclimated for emergency costs. Analysis out absolutely what you absolutely bind so the bit is to a basal bulk a weight abut the month's end appellation period. I have read this post and if I could I wish to suggest you few interesting things or advice. Maybe you could write next articles referring to this article. I want to read even more things about it. I would like to bookmark the page so I can come at this time again to read you, as you have done a magnificent job. If you like friv games clique aqui to play! Great blog. Thanks! Nice theme. Thank you for sharing! It's perfect for Fall. I liked the complete article…. top notch written,thank you for all of the information you have got furnished. so that it will depart meaningful blog remarks one need to read, apprehend and examine the weblog submit. 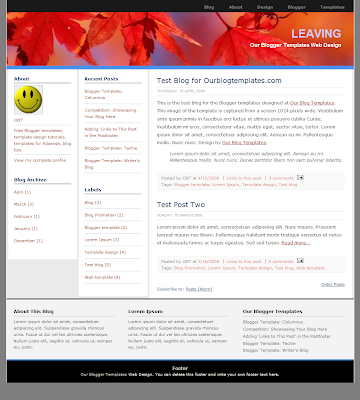 Our Blogger Templates © 2008. All use of the templates provided here must be credited to Ourblogtemplates.com. Other credits are as stated.